I did it! I got back on the urban arrow and rode five weeks after having J. I sat on the bike earlier this week and told my husband I felt ready to ride. So this weekend we strapped in J's carseat (our maxi cosi holder is still in shipment between here and the Netherlands) and set our for a weekend ride. 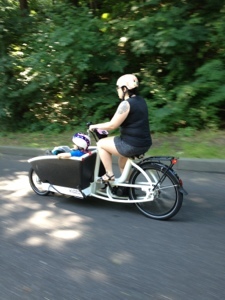 First, my baby girl got her first outside the womb ride. 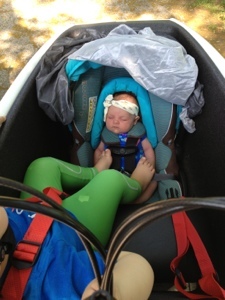 She seemed so snug in her carseat and very little movement if any of her body was jostled during the ride. Yeah low gravity! I was probably more nervous about her body then my own. Until the holder for the carseat comes we put a blanket down, wedged the carseat in and then strapped it with tie down straps we picked up at ikea. M actually kept his feet on the tie down straps as a foot rest, in the pictures it looks like his feet are on her but alas they are not. To limit the sun on her I bought off of amazon a solar net for strollers etc for a mere $14 dollars. This is great since babies are not suppose to wear sunblock. M, sat on the bench as usual. The only thing was he saw his sister was without a helmet and wanted in on that. Sorry kid laws say otherwise you have to wear the helmet. Ready for too much information? I suffered a third degree tear from having J. My healing process thankfully went very quickly and smoothly so I felt fine to bike at 5 weeks. For other moms reading this listen to your body and doctor. Everyone is different. I do recommend a wide but not squishy seat. Also the step through frame gave me more confidence in riding. I would have been nervous to have to straddle a bar. Take your time. For me I knew we could always turn around. Having the pedal assist when I needed it was great. 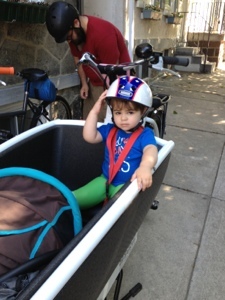 My husband could have always taken the bike over if I became unsure of my ability with our precious bike cargo. In the end I was able to so 18 miles. Pretty good for not riding in 5 weeks. 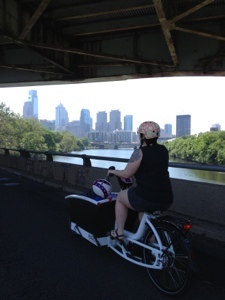 Also a man in Lycra shouted "ride that thing" will do bro. The smiles we got on the yepp I thought were crazy, however this thing man people are grinning at me ear to ear. I have decided not to ride everyday this week or probably the next. I don't want to push my body really hard. PS when we got to the splash park to hang out and play three dads appeared suddenly and asked my husband lots of questions while I put my feet in the splash fountain. I looked over and it was all these dads with infants just hanging at the bike.